It's never good to start a Monday exhausted, am I right? Eleemosynary opened on Friday night, and the actors were wonderful. I was one kvelling director, and hooray for the great review that appeared online on Saturday. There were four shows that opened on Friday--in Anchorage, of all places--so we're all fighting for audiences and hopefully the review will help. On Saturday, I cooked a massive dinner for my mother-in-law Hope. I seriously lucked out in the mother-in-law situation, although I'm not sure how hyperactive David emerged from fairly zen Hope. I'm going to be wondering about that one for years. So Saturday was serious cooking therapy--I'll be posting the results of the session this week. It's really starting to look like spring in Alaska, which means melting gray snow, roads that are alternately slick and dry and moose ambling out of the woods in search of food further afield. If you're ever thinking of coming to Alaska, this is probably not the time to do it. This gorgeous salad is colorful, crunchy and substantial. With the butter lettuce, it just looks like spring. Although the original recipe called for baby heads of butter lettuce, no such luck finding those here, so I used a hydroponic full-sized head of butter lettuce. Although my salads looked nowhere near as gorgeous as the ones in the cookbook, they were still suitable for impressing my mother-in-law. First, make the vinaigrette. Then chop the toasted hazelnuts and toss with the oil and salt. When you have sliced the red onion and divided it into rings, place the rings in a small bowl of ice water until you're ready to use them. 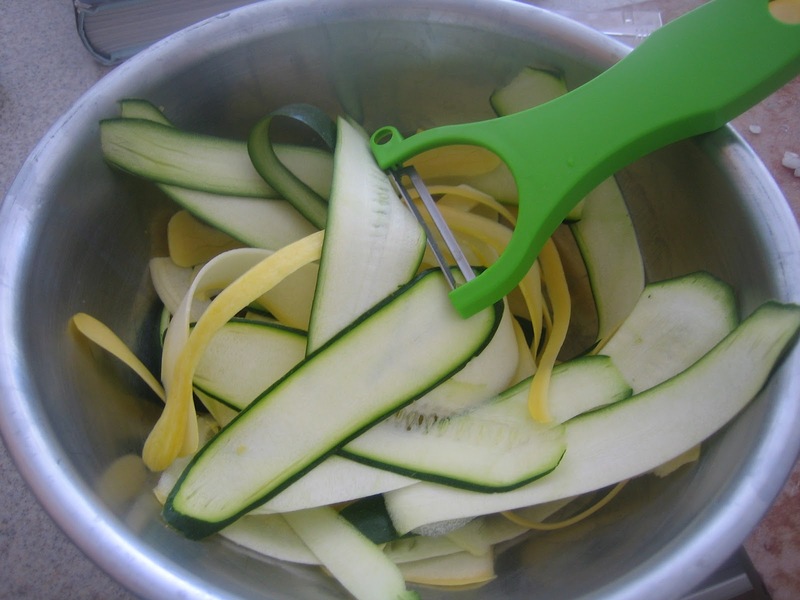 Combine the zucchini and squash shavings in a small bowl and toss with one tablespoon of the vinaigrette. Place one large leaf of the butter lettuce on each salad plate. 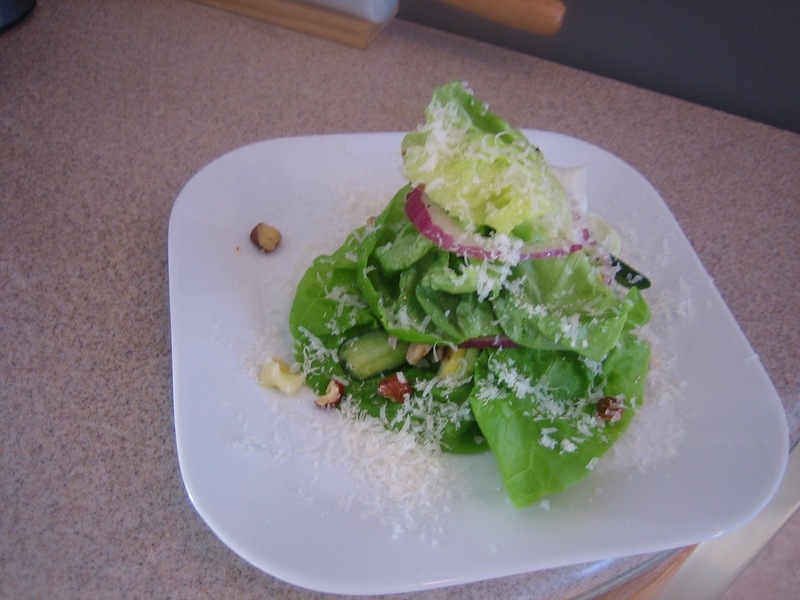 When you are ready to plate, tear the remaining lettuce into large pieces by hand and toss with the vinaigrette and half a cup of the hazelnuts in a large bowl, being careful not to overdress the salad. Any remaining vinaigrette will keep in the fridge for at least a week. Add a small amount of salt and pepper to the dressed salad if necessary. Mound a small amount of the zucchini-squash mixture on the lettuce leaves on each plate, then carefully pile a small amount of the dressed lettuce on top. Then carefully slide two rings of the red onion around the lettuce leaves, which should then hold their shape on the plate. Repeat with the remaining plates, then sprinkle a few additional hazelnuts on each salad and dust with the Parmesan. Makes six appetizer-size salads. Sounds like a successful play. The weather is just Ok here, not exactly spring but your lettuce salad is perfect for days like today. 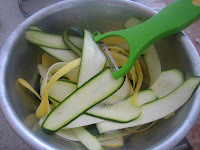 The addition of zucchini and squash shavings makes it a nice change from a conventional salad. Mmm love Mozza and this salad looks just gorgeous!! I am also lucky enough to have a wonderful MIL - makes life so much easier, doesn't it?! Congrats on the wonderful review. Lovely salad. How nice to hear that your play is going so well! You have put in so much time and effort, I am glad it is a success. That salad sounds like just the thing on a warm spring day. I can never get enough vegetables this time of year. I wish I had moose just casually walking through my backyard. But then again, that would require living somewhere colder than where I do now. This is a beautiful spring salad! Perfect for Easter too. Congrats on the good reviews! This salad looks really delicious! Love that you added the hazelnuts and squash, never done that with a salad! Congrats on your news... love this kind of fresh salad! ITs beautiful! Glad to hear on the reviews and thumbs up for all the work done. We get plenty of butter head lettuce over and its so reasonable priced. With that and salad is like my meals for night, this will be a perfect try out. Lovely pics you have attached and again, its really tempting me to give a try to your simple and easy salad recipe. Congrats on another successful play! You have been a busy bee, especially with the visit from your mother in law. The salad looks amazing, you have me wanting to run out and get some hazelnut oil. I can imagine how wonderful the overall taste was with the hazelnuts and the vinaigrette-yum! Delicious healthy post. 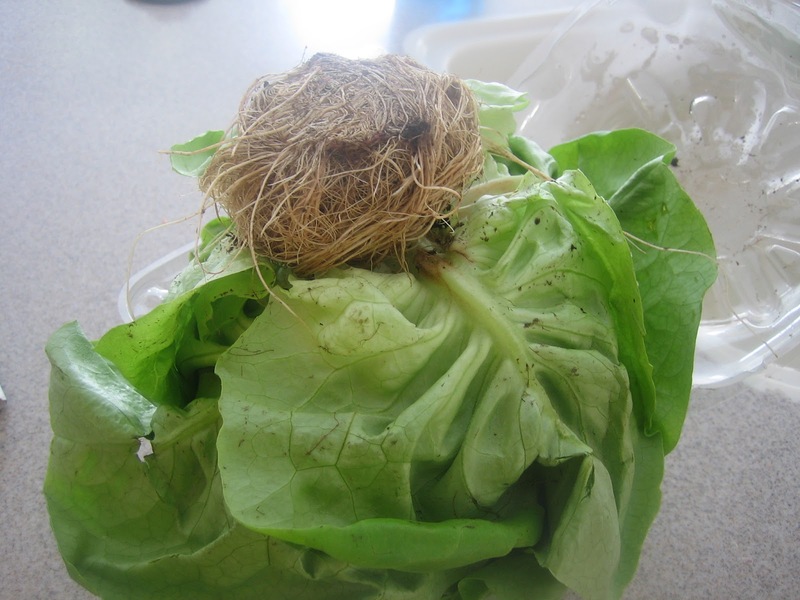 I have a head of butter lettuce in my fridge right now! This is a great use for it! I have no idea how is the spring in Alaska, but this salad would be perfect for Greece now that the temperature has risen to 70's! Aw I love pretty spring salads, I'm soooo ready for the warm weather to come! Its been so nice in Chicago that all of our flowers have already started blooming, its gorgeous! And congratulations on your great review!! I am really into making salads these days and this one is for sure going to be made at my place. It's delicious, healthy and good looking. With our early salad, I have salad on the brain and this is just lovely! Congrats on the play. Onward to the weekend and two holidays! Congrats on the great review! This salad does scream Spring! I love butter lettucs but I rarely see it here outside of the bagged stuff. I can't believe you guys have moose just ambling about, that would be the weirdest thing to see. Glad you had a therapeutic cooking weekend, my boyfriend and his mother are the opposite of your husband & mother in-law. Jared is so calm and laid back and his mom is a really enthusiastic ball of energy lol. Weird how that happens. Well done!! !Your salad looks great!Perfect for spring and I love the addition of hazelnuts and the veggies in there.Looks absolutely delicious and healthy! This salad looks like a delicious side to celebrate with! Cooking really is therapy! People think I'm crazy to want to come home from work and cook, but it really does relax me. I definitely lucked out in the in-law business too. Mine are perfect which makes me cringe every time my crazy side of the family does something totally ridiculous! Glad the play is a success! How delicious! I absolutely love all of the ingredients. Can't wait to try it. It looks really good! Nice photos! Thrilled that the play has gone so well. Lovely your Springtime salad - particularly love the hazelnut oil + hazelnuts - delicious! Love the thinly sliced squash! So pretty. Congratulations! I'm glad your show turned out so well. I too like the presentation and the thinly sliced squash. It's a nice change from chopped or shredded. Wow , that is a great dish recipe for the coming hot .... weather. Well, I'm in Philly, and we didn't have much of a winter, so now in the spring we starting with the summer weather.